“It’s a national shame,” rues Ali Akbar Peerbhoy, the grandson of the founder of the enviable Matheran Hill Railway known to ply the Matheran Toy Train which, today, vies for survival. The red sand, the damp air, the horses and the silence are all under threat. Skewed ‘development’ in its crudest and most dramatic forms through the haphazard maze of ‘roads’ and ‘guest houses’ that have mushroomed all along the pristine zone. Pushy touts and uncouth horse-ride providers operating in flagrant violation of the law have hijacked the very concept of Matheran itself. The elected and governmental authorities continue to turn a blind eye to the scenario. It’s struggling to keep afloat and how! Asia’s only non-motorable hill station, Matheran, also Mumbai’s best-kept secret weekend getaway, now hijacked by local touts and administrative apathy, has been reduced to a joke. After months of talk of the resumption of the Matheran Light Railways Service, better known as the Toy Train Service between Neral and Matheran, shut down in May last year, the Central Railways (CR) resumed the same on 30 October 2017, albeit from Aman Lodge to Matheran. The Toy Train service from Neral to Aman Lodge has been taking time as the 127-degree curve stretch had a lot of work to be completed. Central Railway authorities maintain that the service may start early 2018. They have built 513 km of retaining walls to protect the tracks and the train during landslide. In addition, a 732-km stone wall has been built too. The CR is overhauling the entire narrow-gauge tracks at a cost of Rs 11.25 crore. The Toy Train has been pulled out of service for more than a year now and the two derailments that occurred appear to have provided the perfect reason for a complete overhaul of facilities that include a replacement of the engine and the entire stretch of narrow-gauge tracks. United Nations Educational, Scientific and Cultural Organization’s (UNESCO) designated the Mountain Railways of India as a World Heritage Site owing to them being “outstanding examples of bold, ingenious engineering solutions for the problem of establishing an effective rail link through a rugged, mountainous terrain.” So, the Darjeeling Himalayan Railway received the honour at first in 1999 by UNESCO followed by the Nilgiri Mountain Railway in 2005. The Kalka–Shimla Railway received the title in 2008. The three routes were titled the Mountain Railways of India under UNESCO World Heritage Site Criteria ii and Criteria iv, within the Asia-Pacific region. This site includes the three railways. The Darjeeling Himalayan Railway the first and said to be the most outstanding example of a hill passenger railway was opened in 1881. The construction of the 46-km long metre-gauge single-track railway in Tamil Nadu, the Nilgiri Mountain Railway was first proposed in 1854 but due to the difficulty of the mountainous location, work on the same was commenced in 1891 and completed in 1908. The Nilgiri Mountain Railway climbs from an elevation of 326 m to 2,203 m and was representative of the best technology available then. The third, the Kalka Shimla Railway comprised a 96-km long, single track working rail link, is symbolic of the technical excellence needed to provide connectivity to mountain populations. All three railways are still fully operational. The three railways satisfied UNESCO’s Criteria to qualify. Criterion (ii) being: The Mountain Railways of India are outstanding examples of the interchange of values on developments in technology, and the impact of an innovative transportation system on the social and economic development of a multicultural region, which was to serve as a model for similar developments in many parts of the world. The Mountain Railways of India exhibit an important cultural and technologically transfer in the colonial setting of the period of its construction, particularly with regard to the eminently political function of the terminus station, Shimla. The railway then enabled significant and enduring human settlement, of which it has remained the main vector up to the present day. And, Criterion (iv): The development of railways in the 19th century had a profound influence on social and economic developments in many parts of the world. The Mountain Railways of India are outstanding examples of a technological ensemble, representing different phases of the development in high mountain areas. The Mountain Railways of India are outstanding examples of how access has been provided to the plains and plateaus of the Indian mountains. They are emblematic of the technical and material efforts of human societies of this period to disenclave mountain populations through the railway. They are well-maintained and fully operational living lines. They are used in a spirit and for purposes that are the same as those at its their inception. Matheran’s Toy Train service too was to be included in UNESCO’s Mountain Railway series and had been placed in the tentative list. Prospects for Asia’s only non-motorable hill station obtaining a UNESCO Heritage Status seems sadly jinxed. There are a series of litigations initiated by the Founder of Matheran Railways Abdul Hussain Adamjee Peerbhoy’s grandson Ali Akbar Adamjee Peerbhoy against the Government of India over issues of renaming the Matheran Railway Station and the validity of an agreement between the Matheran Steam Light Tramway Co Ltd., referred to as Matheran Railway Company and the Governor General of India and now pending in the Bombay High Court. In a correspondence initiated by the petitioner Ali Akbar Adamjee Peerbhoy with UNESCO, he apprised them of his long-pending issues with the government wherein he contests legality of the very sale of the Matheran Railways and insists upon a change in the name of Matheran Railway Station and an inclusion of the founder, his grandfather’s name. “UNESCO has, following my correspondence with them, on the legal issues involved with Matheran Railways, reconsidered their prior decision to include Matheran Railways in their list of India’s Mountain Railways,” says a disgruntled Ali Akbar. Concurrently, the discontinuation of the train’s services for more than a year since its derailment in May 2016 didn’t augur well for its heritage status. That apart, the entire overhaul of the systems, to put it on par with modern needs and the replacement of the engine and narrow-gauge tracks may well impair the Heritage Status of the Matheran Railways. While safety of the commuters has been offered as a pretext for the delay in resumption of services, the exhaustive overhaul of its systems including its tracks and the creation of buffer walls to protect the train from landslides for over a year and more, seems outright excessive. Instead of ensuring the swift resumption of Rail Services along the zone with a sense of immediacy, the delay only worsened the situation for tourists left with little option but to get looted by the locals plying taxis to Dasturi Naka and back to Neral as well as Horseback Ride Providers and Hand-pulled Rickshaws charging tourists at pure whim. Why, the hill station also registered a spurt in illegal construction activities as two and three storeyed structures even ‘buildings’ have come up at Matheran after procuring ‘permissions’ to undertake ‘repairs’ from the local authorities. The local authorities or the municipal council put up the defence of ‘development’ which the hill station is lacking and the need for ‘roads and facilities’ that otherwise is available to everyone else. The law on the status is clear. Nobody in Matheran is permitted to build anything beyond the Ground Plus One level. And, despite the law being flouted flagrantly over the last few years, the State continues to remain silent on the actions it proposes to take regarding illegal constructions in Matheran – an eco-sensitive zone in Maharashtra. A matter before the National Green Tribunal initiated by applicant Bombay Environment Action Group pointing out the violations under the Forest Conservation Act in the forest-like Matheran zone remains pending. 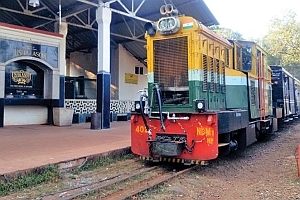 The temporary resumption of the Toy Train service from Aman Lodge to Matheran, plugged as a tourist facility, is preposterous in that the toy train runs for a bare kilometre as opposed to the overall 21 kilometre-stretch from Neral to Matheran. Also, the trip is more symbolic rather than practical and functional because it doesn’t provide any real transport solution to the tourist who must use the Taxi Service to reach Dasturi Naka before being able to avail the Toy Train. Matheran is, as signified by the very name, a mountain table topped with a jungle ensconced in the Sahyadri Range of about 20 square kilometers with two thickly-wooded ridges, rocky structures and breath-taking views of valleys over 2,000 feet below. As the morning mist clears, these are revealed gradually. The native inhabitants were wild forest races of non-Aryan origin and predatory habits such as Dhangars, Thakurs & Kathkaris. Sadly, at this scenic range, with the authorities least inclined to stop the rot, it’s a virtual free-for-all for touts and racketeers. The initiation of the Toy Train service from Aman Lodge to Matheran of late does provide a breather from the Horseback Ride Providers who charge anything from Rs 1,000 onwards for a one-way ride either to or from Matheran. For the elderly, infirm or those with children, the option to travel to Matheran from Aman Lodge or back was merely by road – and a stony stretch that could be a huge deterrent for those impaired by age or infirmity. The Horseback Ride Providers, a sizeable and strong lobby of Matheran locals, would simply not buckle from their ‘pre-fixed’ exorbitant albeit ‘illegal’ charges making a visit to the Hill Station beyond the reach of the common man. A day’s trip for a Mumbaikar to and from Matheran for a nuclear family could land up costing a fortune with Horseback Rides for four to and back costing more than the entire journey for the Mumbai family and expenditure along the way. With the stoppage of the Toy Train Service to the Hill Station following the two derailments, for the last year, it was a free-for-all for the Taxi Service operators from Neral to Matheran who would charge Rs 80 per passenger technically as is even ‘written’ but most tourists would have little option but cough up Rs 500 one way in case they can’t wait for an hour or two for the taxi to “fill up” with ‘six’ passengers instead of the mandatory ‘four’ permitted by the law. And, all of this in full public view and with the connivance of local authorities who conveniently look the other way. Try putting up a protest and you could be left waiting for a few hours at least with others, mostly locals, filling up as groups book taxis and travel together. The lobby of Taxi Service Providers is again run by a group of locals who have strongly resisted the Toy Train Service being restarted. After all, they are the ones affected directly. Not that it’s making any difference to Kamla – a native of Dhodhani, a village at the base of Matheran – who transverses across the treacherous pathways uphill, barefoot, every single day to reach the Matheran Market and sell the berries, mangoes or bananas she wraps in a dusty potli she carries with her all the way. The natives of Dhodhani, primarily Kathkari tribals, conversing in a local Kathkari language – bearing similarity to Konkan languages – are slim, wiry and strong. They walk for miles on end to and fro their village Dhodhani everyday right till the forest on the head of the hill – Matheran. Content with their average sales of, at best, Rs 50 a day, the natives are least concerned with transport issues and sell their edible wares mostly to locals of Matheran near the market. Matheran was explored as a summer resort at the same time as India’s first railway company (the Great Indian Peninsula Railway now the Central Railway) was formed in 1849. After the construction of the Matheran Light Railway (MLR), it became a popular resort of the British Raj in India and still remains a hill station near Mumbai (India’s financial capital). The Matheran Light Railways was proposed as an extension to the inscribed series, the ‘Mountain Railways of India’ that has three components namely the Darjeeling Himalayan Railway (1999), the Nilgiri Mountain Railway (2005) and the Kalka Shimla Railway (2008). The MLR is a linear Property about 19.97 Kilometers long and 0.61 metres wide, which ran from Neral (located at an elevation of 39.31 m) to Matheran (located at an elevation of 803.98 m), in the Sahyadri Range, entirely in the state of Raigad district in Maharashtra, India. “It’s abysmal,” exclaimed Mumbai restauranteur and Matheran regular Sachin Shetty. “Watching the hill-station deteriorate from its early glory to the present-day mess that the locals and authorities have created thanks to their apathy is depressing to say the least,” he says. “Now, it makes little sense to visit the hill-station particularly since there is so little of the famed red sand available. The local touts literally gang up and hound tourists who’re left with little option but to avoid visiting Matheran the next time around,” adds wife Rashmi Shetty. A Ropeway from Bhivpuri, near Neral right upto Matheran Hill Station is being eagerly anticipated. Plugged to be one of India’s longest ropeways, the project faces huge opposition from local hotel owners who feel that construction to assist the Ropeway could ‘wreak havoc’ to the ‘eco-sensitive hills and forests of Matheran’. The concern, in the face of the spate of illegal structural extensions undertaken by the locals of Matheran themselves, seems rather farcical to say the least. After pursuing related approvals even from the Supreme Court, an NOC from the Ministry of Environment and Forest and procuring a final order in the regard by the Public Works Department, Government of Maharashtra in 2012, the Ropeway is all set to arrive in Matheran providing the much-needed succour to tourists and relief from the local touts. Once the Toy Train service is initiated, the State will need to crack down on haphazard constructions of unauthorised Hotels and Guest Houses and focus on maintaining the pristine environs of Asia’s only non-motorable Hill Station lest it meets the fate of the hills of Uttarakhand.